Hey, it’s been a while. Sort of… Um yeah and I still really like this romper and it makes me happy because it’s floral and there are shorts! Ha! In completely unrelated news: I saw the cutest baby when I got off the bus today, it looked sort of like a turtle and it was wearing a green plaid jumpsuit! That was a really cute baby. Hope you all had a great thursday! Just one more day until the end of the week. 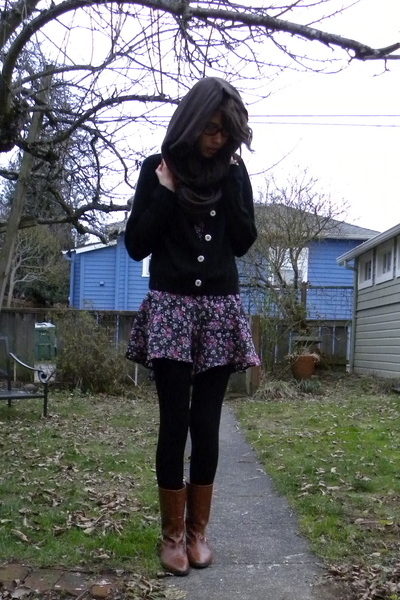 love the romper and scarf, nice cardigan and boots too! I love the skirt and boots! this outfit is simply adorable. wow love this outfit! so cute and great pairing with the boots! love the romper. whered you thrift it? love your skirt and boots ! yes, almost the weekend. thank you :) i love them too. so cute and love the romper! I love the peeking floral!